BEIJING, SEPTEMBER 1999 - I arrived alone in Beijng 'old' international airport - the new airport (currently used by international flights) was to open some weeks after I arrived. Airpanes were parked next to the runway, in the same way as you would park cars. We had to wait for the 'stairs' to get of the airplane - facilities were obviously very limited here. After some walking through corridors and onto stairs, and after going through visa control and collecting my luggage, I arrived in the main hall of the airport building. The crowd was overwhelming - hundreds of Chinese walking, standing, sitting, shouting...elbows had to be used to get through. After I changed some dollars into Yuan (some search work necessary to find out where the 'bank' was and the procedure to be followed) , I was ready for my first trip by Chinese taxi into the city of Beijing. To get to the hotel - since I don't speak Chinese - I just brought a note with the Kanji writing of the name of the hotel. "Uh huh " was the drivers response - so far so good. It struck me that the highway was not at all crowded - that is, the direction going into town - in the opposite direction there were many traffic jams. When I reached the city, we passed huge hutongs (traditional century-old housing) along the sides of the main roads of Beijing. Further there were the big newly built hotel blocks. Afterwards I've discovered that my driver did some 'extra sightseeing' to get more Yuan on the taxi meter display. By the time I arrived in the hotel we had passed it already a couple of times, but the ride was still very cheap to Western standards. Some days later I had the idea to go the famous Summer Palace. Since this is located outside of Beijing, and I wanted to try something else than the taxi, I decided to take public transportation - the bus. My guidebook said that I had to take bus number 808. Finding the bus terminal on the corner of Chong Wen Men av. and Qiamen av. was the easy part - all I had to do is wait for the bus with the right number on it. Explaining where I wanted to go was something else... ! Once I was sitting in the bus, some of the 'staff' of the bus came along to sell tickets. Chinese buses always have a minimum staff of three to four people, including a 'hostess' and a mechanic, next to the driver of course. The words 'summer palace' only provoced a smile on this lady her face. Seemingly they were not used to tourists on this bus (I was the only non-Chinese person on the bus). Suddenly I remembered that I had bought postcards the day before - there should be some picture of the summer palace on one of them. I went through the postcards, with the lady next to me naming all the places and buildings in Chinese. I had to nodd everytime to make clear this was not where I wanted to go. 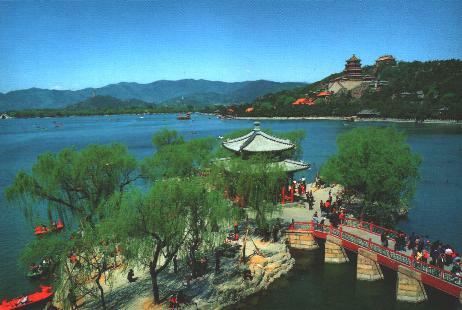 Luckily I finally found the postcard of the Summer Palace. "This is where I want to go", I said while showing her the postcard. An "Aha" later, she gave me the all-Kanji-bus-ticket. I gave her some Yuan banknotes - she gave me almost all of them back, together with some coins. This busride was under one US$ for a total duration of one hour. At least that was the estimated travel time the guide book told me. The bus stopped at several locations. Lots of people getting off. I was already thinking about the "where should I get off" problem, the bus ride now took already almost two hours. The bus was maybe going to drive to another village or town. At one of the stops, I showed my postcard again to the lady that had sold me the ticket. She made somehow clear to me that this was not the stop I needed. Some stops later, she approached me, showing this was the stop I needed. There was a small village that had only some dirt roads. But there were many taxis on this parking lot and there were tourists nearby. I followed 'the crowd' and came face-to-face with the main entrance of the summer palace. At first it was not clear to me where to buy a ticket. I passed a big gate, supposing that this was only the entrance to the park and that there would be a ticket booth further away. A young man in a uniform asked me "No ticket sir ?". I tried to ask "where to buy ticket ?". He replied "come with me,sir " and we went together inside the park. When we were far enough away from the gate, so that the other people could not hear us anymore , he told me "15 Yuan, sir, no ticket". Understanding what he was trying to do, I returned to the gate and went outside again. Sure there would be some ticket control later on or when leaving the Summer Palace, and then I would be in trouble. As I went back, I noticed a ticket booth before the gate on the right. It was closed. Maybe lunch break or something. I waited for a couple of minutes till someone came to the booth. I bought a ticket, went on through the gate again (this time the young man that almost got me in without ticket, checked it carefully...). To the people standing nearby the gate (probably his friends) , this was very amusing. The summer palace visit was really worthwhile. It is a huge complex however and a little map (with English and Kanji names) is not a luxury item. I got back into the city by taxi. In China there are generally three 'grades' of cabs - the cheap ones only cost a few cents per 'driving unit', are the smallest, mostly red, and have the most 'unsafe' drivers as was demonstrated later on... On the highway it was starting to rain pretty much and my driver didn't really notice that the cars in front of him where suddenly stopping ! Fortunately he managed to stop 'just-in-time'. I was relieved I didn't have an accident, he just seemed to go on as nothing has happened. Of course, being a local, he was used to driving in China. 3) even after a near-accident , just go on as nothing has happened. 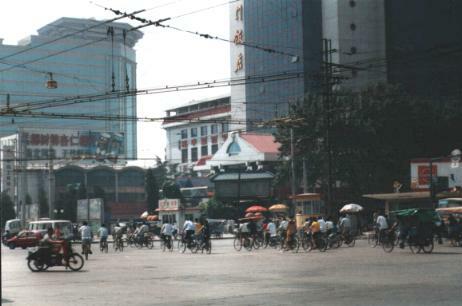 I was glad to be back in the hotel safely, but this adventure had learned me a lot about the real day-to-day China.